We need a cheery fast paced music piece for a casual mobile game. 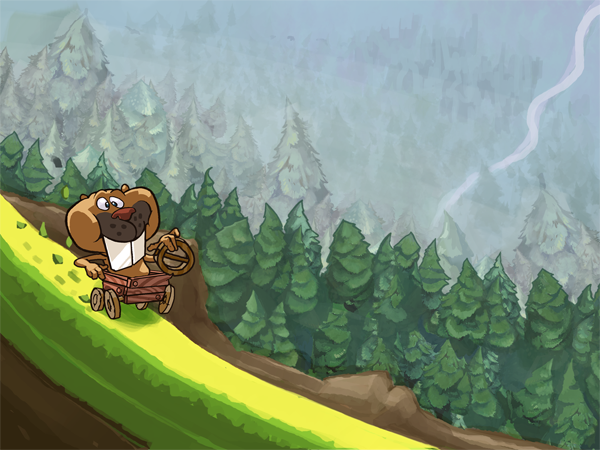 The game is about speeding downhill with a Beaver in his trusty kart. The kart is made by the beaver from supplies found from the forest. The hills are high and steep, filled with dangerous jumps & obstacles. The beaver himself is a bit loony and not afraid of speed nor the dangers of these hills. The music should be rhythmic with a relatively high tempo to alleviate the speed and the fast pace of the game. Think of chase scenes and high adrenaline speed scenes. The beaver will gain speed as the hill progressively gets steeper and steeper and it would be cool if the music could also convey the ever increasing excitement. Each race ends with the beaver crashing in some hilarious fashion and each session lasts a different amount of time ranging from a few seconds up to couple of minutes, so the music has to have an easily loopable section in the middle. The game is set in multiple different kinds of natural environments with a bunch of different animal characters and the music shouldn’t be too tied into one kind of biome. End portion of a few secs that is played once the player crashes and should make the player feel bad for failing (when the player crashes the midsection is quickly faded out & the end section is played). I've added some reference videos below for inspiration, but naturally we are more than open for something completely different.